Lincoln is trying to rebound from two straight years of U.S. sales declines and wants to continue the momentum started by the Navigator, Nautilus and Aviator utilities. Cadillac is overhauling its own portfolio and is in the midst of launching a new or redesigned product roughly every six months through 2021. The Cadillac CT5 technically debuted last month online, and Automotive News reminds us that Andrew Smith, Cadillac’s executive director of global design, proclaimed “boring sedans are dead.” I don’t know about that; boring sedans have become an epistemological truth at this point. Long after humans are gone from this or any other planet, a new species will emerge that will debut a new sedan every few months, triumphantly proclaiming that boring sedans are dead. 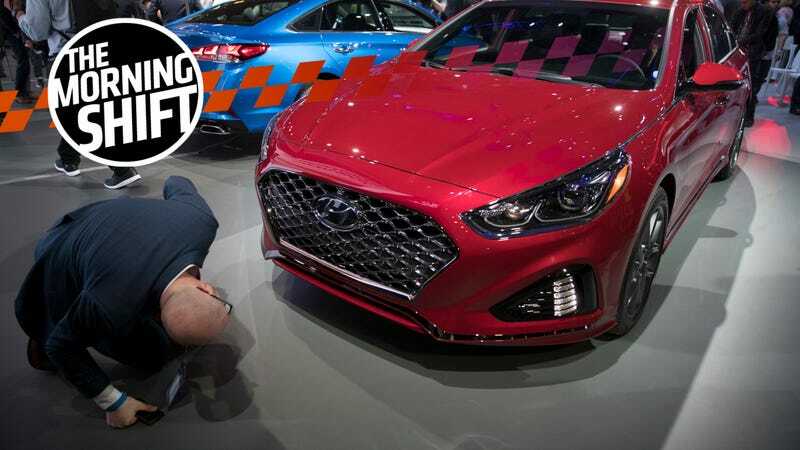 Anyways, Jalopnik will be at the New York International Auto Show in force, so stay tuned this week for lots of reports about cars other than sedans. It doesn’t take a corporate governance expert to recognize that a CEO office, staffed exclusively with an inner circle loyal to said CEO and largely insulated from the rest of the corporate structure, could provide ample temptation for malfeasance. But that’s pretty much what Carlos Ghosn had at Nissan! I would be surprised if these are the last corporate governance changes to come from Nissan in the wake of the Ghosn scandal. It’s an interesting time to weigh the likelihood that the Detroit Three’s international representative might change ownership, tie up with someone else or sell off its pieces, but certainty on this seems as difficult to achieve as ever. I mean, hasn’t it been an interesting time to weigh the likelihood of an FCA merger for more than a decade? At this point, my only rooting interest is for a merger with someone, anyone, just so we can stop speculating about the possibilities of an FCA merger for one whole month. From the Department of Making Cars Is Hard, Mazda is recalling 187,798 Mazda 3s (model years 2016-2018) due to defective windshield wiper relays that may cause the wipers to stop working. The Detroit Free Press put out a short article about the recall, first announced by the U.S. National Highway Traffic Safety Administration yesterday. The recall notice can be found here. The two-wheeler was retrieved by Renault from its headquarters near Paris after company auditors questioned whether Ghosn was entitled to the benefit as part of his compensation, said one of the people, who asked not to be identified because the details aren’t public. The scooter was purchased in 2018, the person said. Once you start dropping $3,400 on a scooter, money clearly means nothing to you. Just the trait one wants in someone running a car company. Neutral: Anything You’re Looking Forward to from the New York International Auto Show? Any boring (or not-so-boring) sedans you’re curious about? What non-sedan are you most looking forward to? Do you even care about auto shows?